APPLICATIONS: Designed to fit structural and architectural metal roof systems with standing seams. 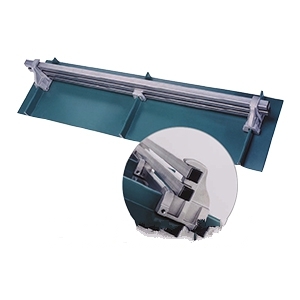 DESCRIPTION: Berger E-Rail, F-Rail and S-Rail series snow rails are non-penetrating devices which are secured to the standing seams of metal roofs utilizing non-pentrating stainless steel set-screws to clamp them in place on the roof seam. E-Rail design accommodates both one or two Square-tube rails. Receptor Slots are included for optional ornamental attachments. SEAM SHAPE: Clamp castings are designed to accomodate a seam of up to .516" thick and at LEAST 1-1/2" high. Rail Options: F-Rail for 2-3 rails, S-Rail for single rails. Finishes: Available in mill finish cast aluminum, medium gloss black epoxy primer finish. #8 X 1/2 Hex Washer Head Sheet Metal Screws. Zinc Plated. 100/Bag. Price/Bag. #8 X 1/2 Inch PHIL PAN HEAD SMS. ZINC PLATED. Price per 100.